St Mary’s, the University Church, dates from the 11th century. It is where the Protestant archbishops Cranmer, Ridley and Latimer were tried for heresy in 1555. The Wesley Memorial Church, New Inn Hall Street, is in the heart of Oxford, next to St Peter’s college. It has been modernised to make it a comfortable venue for concerts and other events. 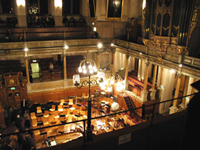 The Sheldonian Theatre was designed by Christopher Wren for the University of Oxford. It held the first performance of Handel’s oratorio Athalia in 1733. Keble is an architectural phenomenon and the chapel has a splendid acoustic for choral music. 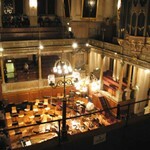 The Holywell Music Room is the oldest custom-built concert hall in Europe, opening its doors in 1748. The venue was restored and refitted in 1959-60, and the frontage and vestibule restored in 2010.